Six months into our time at BHFH, we’re enjoying life in the house so much that it’s hard to imagine moving elsewhere. But all residents are term-limited at a max of four years and there’s always a possibility that our stay could be shorter. So we’ve kept one eye on what might be next, a perspective informed the other night by something called a Coop Crawl — sort of like a pub crawl except that you visit coop housing sites instead of saloons. Collections of like-minded people forming households that typically share space, food and decision-making — and sometimes politics and worldview, too. Common to all three is a commitment to “intentional community,” an approach to daily life that demands and values getting up close and personal with people outside your family. 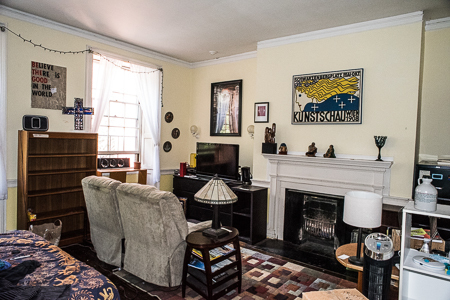 Before we learned that BHFH had a spot for us earlier this year, we came close to making an offer on a two-bedroom unit at JP Co-housing. In addition to the extra bedroom, it offered its own living room/dining room, kitchen and bathroom. From what we could see, the 60 or so people living in the 29 other units represent a friendly welcoming community. And the common area — including big kitchen, play area for the kids and living/dining room with cathedral ceiling — looked inviting indeed. 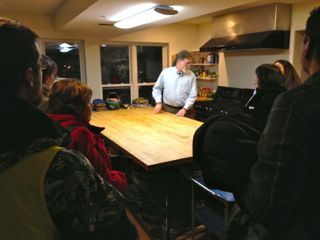 They have periodic group dinners, talent shows and workdays that serve to build community ties at JP Co-housing, and Goodman described the “hour-long walk” from the parking lot to the housing units prompted by bumping into so many friends and neighbors. Friends living in co-housing elsewhere say its communal dimension can often be more theoretical than real, though, given the demands of everyday life. My quick look at a couple of coop housing arrangements during the Crawl indicate a more intensely communal experience than co-housing, but less formally structured than BHFH. The coops I’m discussing here are typically rental arrangements, not to be confused with the legal ownership structure of coops. In some ways, coop housing appears to present the stiffest challenges of the three approaches. Residents decide to live together and, for the most part, make it up as they go along in terms of who’ll do what to sustain a functioning household. Who’ll buy the food? Who’ll do the cooking? Who’ll collect the money for the rent? Don’t get me wrong. 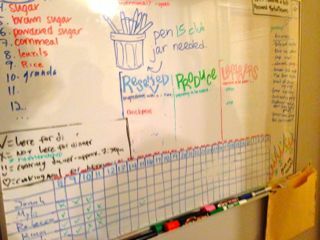 The coops we visited on the Crawl have chore lists just as we do at BHFH. But that work is done with considerably less support than we enjoy on Chestnut Street. The staff at BHFH – a director, a kitchen manager and a residency manager – are paid to keep the house running not only as a place for us to eat and sleep but as place we all want to call home. As important as clean dishes and salted sidewalks are to the life of the house, building and sustaining community life is far more demanding. Mandatory house meetings, which happen twice a month and last a couple of hours (more about them in a subsequent post), play an important role. But so, too, does the Quaker tradition of the house. Although only a few residents are Quakers, the house is run on Quaker principles of community, equality and simplicity. More about that tradition in a subsequent post as well, but suffice it to say for now that I’m finding it a valuable touchstone in house decision-making. Up next on A Year in a Room: A snapshot of the family community Carol and I started building in 1970. What are you finding most appealing about life in your community these days? This entry was posted in Around Boston, Chores, Community, Home. Bookmark the permalink.